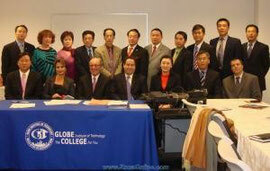 The president of the SAFA Mianping Zhang and the president of Sino-American Culture and Arts Foundation (SACAF) Li Li held a conference about Sino-American Education at Globe Institute of Technology in Manhattan on Nov. 23rd. The purpose for this conference is to advertise Globe Institute of Technology which is able to provide learning programs for new immigrants to land a job. There are more than 120 courses in the institute, including Business Management, Computer Programming, Hotel Management, IT Department, Food Game Design, and other practical programs. The upcoming Chinese Community Advisory Board will assist new immigrants with class choosing and improve their English level. Globe Inst. Of Technology is government approved 4-year-college, offering international student visa I-20. Eligible applicants can apply financial aid from the government. The institute offers associate’s degrees and bachelor’s degrees. One who does not have American education background can also apply.